After attaching the tack of the gennaker to the bowsprit, grab the head of the sail. Follow the luff from tack to head, untwisting the sail as you go. Attach the gennaker halyard to the head with a bowline, making sure that the halyard runs in front of the forestay. Now, fixing the tack and head, follow the leach of the sail to the clew, untwisting as you go. Most Cal Sailing boats with gennakers already have the dowsing line attached, but if not, now is a good time to do so. Likewise, attach the gennaker sheets to the clew, if not already attached. The sheets should be run outside the shrouds and forestay to the gennaker blocks on the sides of the boat. Make sure that the sheets run behind the rest of the gennaker, and not in front of it. In particular, the dowsing line and halyard need to be in front of the sheets. Some boats are equipped with ratcheting blocks. If the blocks do have ratchets, turn them on, and run the sheets through the blocks in the direction such that sheeting in works with the ratchet. Tie the two sheets together in front of the rollbar, either with a double sheet bend or a figure-eight knot. Pulling on the dowsing line will move the gennaker back into its bag. Pull both sheets taut and put in slip knots to keep them from slipping under the boat while sailing. The gennaker should now be ready to go! Proper rigging of the gennaker is roughly sketched below. The jib has been omitted from the sketch for the sake of clarity. As pictured, the gennaker is being flown on the port side of the boat. Note the position of the sheets with respect to the halyard, dowsing line, forestay, and shrouds. If the boat is still on land, you can do a test set by pointing the boat dead downwind and hoisting the gennaker as described in the following section. To really check that everything is working, you can jibe the gennaker on land by slightly changing the angle of the boat and pulling the sheets to the other side. However, such tests are not strictly necessary: if you rig the gennaker as described above, it should hoist without a hitch. Before hoisting the gennaker, the boat should be well upwind of any hazards. This will ensure that you have plenty of time for a nice run, and that if anything goes wrong, you will have plenty of time to fix things. You should also check that both skipper and crew know what their duties are. Once the gennaker is hoisted, things speed up a lot and you won't have a chance to tell your crew what to do in detail. The crew should be sure to wear sailing gloves --- hoisting, sheeting, and dowsing will all be hard on the hands.The bow line should be removed from the front of the boat, as this tends to get fouled in the gennaker. You might similarly wish to remove the anchor line, if it is rigged to pass through the U-bar. To prepare to hoist, head down to a dead run. On some boats (e.g. the Laser Bahia), it is advantageious to pull up the centerboard about one third of the way. This will reduce the boat's tendency to round up, which is the most common cause of capsizes. On the RS500, the centerboard should be left all the way down.Remove the slip knots from the gennaker sheets, and have the skipper take the leeward gennaker sheet. It is possible to hoist the gennaker either with the jib furled or unfurled. There is a rumor that having the jib unfurled is helpful, since it will help blanket the gennaker while hoisting. This is largely incorrect: if you are sailing on a dead run, the main will be completely blanketing the jib, so having the jib furled or unfurled makes no difference in terms of airflow. There is however one good reason to hoist with unfurled jib. The gennaker halyard and the jib have a tendency to get twisted up in each other, both while furling the jib, and while hoisting the gennaker. This can be avoided by hoisting the gennaker while the jib is unfurled. If you wish to furl the jib while the gennaker is not hoisted, a bit of tension on the gennaker halyard will usually prevent it from getting twisted in the jib. In any case, before hoisting the gennaker, make sure that the gennaker halyard is not twisted in the jib. There is some matter of debate whether to furl the jib once the gennaker has been hoisted. Furling the jib may help slightly to fill the gennaker. On the other hand, the gennaker is usually seeing plenty of air, and leaving the jib up will increase your total sail area. While the skipper is holding the leeward gennaker sheet, have the crew quickly pull the gennaker through the cleat and turning block, see figure. For the gennaker to hoist properly, the halyard needs to feed back through the retrieving block located to the right of the cleat, otherwise the dowsing line will not be loose. Thus, the crew should make sure that the halyard doesn't bunch up or twist while entering this block. As the crew pulls on the halyard, the bowsprit should automatically extend in front of the boat, since the halyard will pull on the pole out line, see the figure below. If the bowsprit is not extending, it is likely caught on something, and the crew must go forward to investigate. During the hoist, the skipper should maintain a dead run, and pull the leeward sheet taut to prevent the gennaker from falling in the water. If the sail does fall in the water, it will get dragged under the boat. In such a situation, capsize the boat immediately to avoid tearing the sail. After dowsing the gennaker and righting the boat, you can give the hoist another try. After the crew has hoisted the gennaker all the way up, she should cleat the halyard. If the cleat looks like it might slip, it may be a good idea to put in a slip knot to ensure that the gennaker doesn't drop back down. Once this is taken care of, the skipper may pass the leeward sheet to the crew. The jib may now be furled, or left unfurled, see the discussion above. If the hoisted gennaker appears twisted, letting it fill with air usually will undo the twist, assuming that the sail has been rigged properly. If this doesn't solve the problem, the best solution is to dowse and then untwist the gennaker on the foredeck. Sometimes, jibing the gennaker to the other side of the boat might help as well, see below. The crew is responsible for trimming the gennaker. To get started, let the sheet out until the sail starts to fill. The gennaker is trimmed properly when the upward luff of the sail is just beginning to curl. Maintaining this trim requires the crew to constantly adjust the sheet, easing it until the curl forms and then pulling back in. When the skipper heads up into the wind, the crew will need to sheet in quickly to avoid luffing the gennaker. The same holds true as the boat accelerates, since this will shift the apparent wind forwards. If the boat is in danger of broaching and heads up hard, the crew can often fight this by sheeting in the gennaker all the way to push the bow of the boat back downwind. However, if the boat is already pointing relatively high, doing this might just increase the heel. In this case, the crew should let the gennaker completely luff in order to de-power it and reduce the heel. Once the gennaker has been hoisted and the crew is ready to trim, the skipper should slowly start heading upwind to power up the gennaker. The number one rule is: if the boat starts to heel to leeward, the skipper must fall off hard to reduce the heeling force on the sails and prevent the boat from rounding up uncontrollably. Typically, the skipper will head up as high as is possible without overpowering or luffing the sails in order to ``heat things up.'' In light air, this might be as high as a beam reach, but in heavy wind it will tend to be considerably lower. Of utmost importance is to keep the boat flat --- heeling to leeward could lead to rounding up uncontrollably, broach, or capsize, whereas heeling to windward could lead to a windward capsize during a lull. Hence, balance is key. Skipper and crew should constantly adjust their position laterally to keep heeling to a minimum. In stronger winds, the crew may even work the sheet from out on the trapeze. Another useful tool for keeping the boat flat is the main sheet. The skipper should actively work the sheet, not only for sail trim, but to compensate for gusts and lulls by respectively sheeting out and in. Finally, it is also important for skipper and crew to shift their weight aft. This will help the boat get planing and prevent it from doing a nosedive, which could lead to a broken mast. For an added challenge when flying the gennaker, it is fun to attempt to jibe. All the advice you've heard for performing standard jibes applies here, possibly most importantly: keep the boat flat! After heading down to a dead run, the crew starts sheeting in on the lazy gennaker sheet to pull the gennaker over to the other side of the boat. As this happens, the skipper jibes the main. Often, a better approach to jibing involves going straight from a broad reach to a broad reach on the other tack. 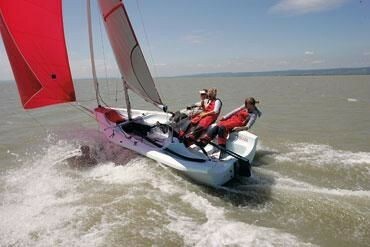 Jibing in such a fashion, the boat has more speed, alleviating pressure on the main sail during the jibe. It is key that, after turning through the jibe, the helmsperson prevents the boat from turning further into the wind. Failure to do so typically leads to a capsize. Typically, if the crew waits too long to jibe the gennaker, it will become twisted twisted around the shrouds and not pull all the way to the other side. In such a situation, the best option is to jibe both sails back to the original tack. After getting everything straightened out, skipper and crew may attempt the jibe anew. To dowse the gennaker, head down to a dead run. The crew should pass off the sheet to the skipper, who should pull it tight. The crew pulls on the dowsing line until taut, then pops the halyard cleat and continues pulling. As necessary, the skipper eases the sheet as the sail is pulled back into the gennaker bag. Important throughout is that the gennaker does not sag into the water. This is achieved by the skipper keeping the sheet taut, and the crew not easing the halyard too quickly. Once the sail is completely in the bag, make sure to retie the slip knots in the gennaker sheets to keep them from getting tangled under the boat. In lighter air, a particularly elegant way of dowsing the gennaker is to pull the gennaker sheat tight, and then jibe the boat without pulling the gennaker (or jib) across. The gennaker should now be backwinding against the jib. When the halyard is eased, the gennaker will fall neatly onto the foredeck of the boat. As the dowsing line is pulled in, the bowsprit should automatically retract. If the bowsprit does not retract fully, the crew may manually pull it in by grabbing it at its base, or pulling on the line affixed to its base. If the bowsprit still refuses to completely retract, chances are that there is still tension on the halyard, which in turn is pulling on the pole out line. Or something (like the anchor chain) is blocking the bowsprit from pulling in. Check that the halyard is uncleated, and not catching on the turning or retrieval blocks as pictured above. In order for the bowsprit to fully retract, it may be necessary for the head of the gennaker to remain slightly above the bow. In any case, the bowsprit must be retracted fully before docking to avoid damaging it.